If you are in the market for a digital signage solution, here are resources to help you figure out how to start, decide what you need, show you how it works, and understand what’s next. Recent advancements in flat screen display have opened up exciting opportunities to better inform customers and attendees and drive sales and improve and enhance your business. Today’s displays offer 1080p high-definition video delivery and touchscreen capabilities, along with the ability to change messaging at a moment’s notice based on interactive feedback and sophisticated analytics. Moreover digital out-of-home signage brings information, education, and advertising closer to patrons, shoppers, visitors, travelers, staff, and students. So you want to buy a digital signage solution, but how to start? Let’s begin with the basics. In “Digital Signage 101,” you’ll learn the four functions of digital signage, as well as strategies and tips for looking at the different functions of digital signage and understand the components of a digital signage system. Implementing a successful digital out-of-home solution involves more than just selecting a suitable display, so here are some of the important questions you need to ask before you buy. Key variables to consider include: screen size/type, location, configuration and wiring, media players, networking, testing, content creation and management. Click here to download "Digital Signage 101." OK, now that you’ve been briefed on the basics, let’s look at how an actual, state-of-the-art digital signage solution can work for you. 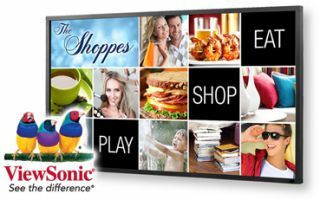 Check out this video where Gene Ornstead, director of product marketing for ViewSonic, describes the company’s new 70-inch interactive flatpanel display. Gene shows how the ViewBoard Software is used to set up and take advantage of its functionality, which includes showing interactive ads, wayfinding, and driving increased user engagement, allowing customers to interact in a fun and informative fashion. While you are considering a digital signage solution now, you need to understand where the technology is going in the future. This report, “Emerging Trends in Digital Signage” will help you understand how screen technologies are evolving, and how new capabilities such as predictive analytics, near-field communication, and large-format touch screens can help your business or organization. Click here to download "Emerging Trends in Digital Signage." Finally, here’s a case study from the Twin Arrows Navajo Casino outside of Flagstaff, Arizona. See how Twin Arrows went about buying 100 large-screen LCD displays, including two big 10-screen video walls built back-to-back so video content could be seen from both sides.